​The Best Floor Polishing in Lancaster County! We offer the best Floor Care and Floor Polishing in Lancaster County by using the best Floor Care techniques, Equipment, Floor Chemicals and Wax, and training. 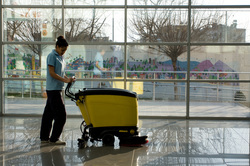 All of our Commercial Cleaners are highly trained and ready to take on any sized Floor Care project. We stay up to date on the newest techniques for Floor Stripping, Waxing, Buffing and Polishing! From Weekly Scrubbing and Mopping to full Floor Stripping and Waxing, we offer the complete Floor Care package for any sized Business in Lancaster. We provide Floor Polishing for Restaurants, Car Dealerships, Medical Offices, Schools, Business Offices, Churches and more! When you have a high traffic area your floors can become dingy from the wear and tear of the constant traffic. Business Owners can help to cut the wear on their Floors by utilizing quality Mats and Floor Wax. Quality Mats will capture more dirt which will keep your Floors from getting scratched and dingy from the sandpaper type action when your shoes contain dirt and dust. We offer Floor Polishing for VCT Tile and many other Floor Materials. We only use the best Floor Waxes and Buffing Equipment so that you get a quality Buff and Shine each time we Polish your Floors. For all of your Commercial Floor Polishing needs, you can count on Lancaster Commercial Cleaning 24 hours a day, 7 days a week. Call now for a Free Floor Polishing Quote or fill out the form to the right for Floor Polishing prices in Lancaster, PA.